1. The only sustainable change happens by changing our behavior. Quick fixes don't work and have never worked, at least for long. The ultimate key to success is to change our daily habits. If you want to get healthy then each day you must increase your amount of activity and control what you eat. The problem is that changing our behavior is incredibly difficult. 2. There is no magic bullet, formula or concoction, we must control our calorie intake and increase our activity levels. If we spent the time we spend looking for the magic formula moving we would be a lot better off. Part of the problem we have in this "Information Age" is the rampant amount of pseudo information or outright wrong information. "Wellness" has become a marketing term. We are constantly bombarded by the next magical program that will transform us. The sad part is that most will utilize some pieces of information to make them sound plausible and then are wrapped up in a slick sales pitch to get us to buy. The 'snake oil' salesmen have been around forever and aren't going anywhere, they just keep reinventing the 'snake oil'. If it sounds to good to be true then guess what, it is. 3. To avoid injury you need to develop a program from your current fitness level, with gradual progressive increases. Going 0-60 as fast as possible is a great way to get hurt and lose motivation quickly. American's now act like Veruca Salt, from Willy Wonka, "I want it and I want it now!" We have no patience and like the song says, "don't care how, I want it now!" So, starting on January 2nd the gyms will fill up and everyone will take to the streets to make it happen. Regardless, of the last time we actually did anything we will go full speed with visions of us as a model in our heads. It doesn't matter that our bodies cannot adapt that quickly, we will force through it. "No Pain-No Gain!!" Becomes our mantra. In reality, Pain=No Gain, if we really want to change our behavior and with it our health and weight causing ourselves pain is counter productive. We are wired to avoid pain (Well most of us). If our old habits don't cause us any discomfort then the thought of replacing them with painful ones won't go so well. We will come up with any excuse possible to avoid the future painful situations. 4. Finding the right intensity of activity/exercise with either HR Zone or RPE (Rate of Perceived Exertion) scale. How do you know you are at the right level of exercise for your body? Listen to it! As long as you are not on Heart or Blood Pressure Medication you can utilize your Heart Rate. It's simple 220-age gives you your Max Heart Rate. When just starting out stay in the 60-70% range. If you don't want to deal with that then use the Rate of Perceived Exertion Scale. This is a scale that corresponds with heart rate and can be used by anyone even people on medications. It has also been redone as a 0-10 scale but I like the original Borg Scale. When starting out stay in the 11-13 range. You win by consistently increasing your activity level, not by going all out a couple of times and then quitting. A new simple method of controlling nutrition. 50% of your plate should be fruits and vegetables, 25% grains (potato, rice, pasta) and the remaining 25% protein. Without proper nutrition, your body doesn't have the correct fuel to continue to run. It is almost impossible to workout enough to 'eat whatever you want'. So without nutrition controls you cannot meet your goals. 6. Hydration is also key to losing weight and getting healthy. We are chronically dehydrated! We don't drink enough actual water and no the 64 ounce super big gulp of diet soda doesn't count. The old 8x8 or to drink 8 glasses of water 8 times a day is actually not enough, it actually depends on, wait for it, your actual size. The bigger you are the more you need. Note, once again that one size doesn't fit all. One other issue, if you drink anything like caffeine or alcohol then you need to drink even more to overcome the diuretic effects. 7. Don't forget your Mental and Spiritual Wellness. Take time to work on these other vital aspects of overall wellness. Physical activity has been shown to help with Mental Wellness and performance but you need some down time to mentally recover. In this age of distraction I think its vital to put away all the electronic devices and spend time in quiet. Whether, it is prayer, meditation or simply just quiet time, give your mind some time each day to just be at peace without distraction. Good luck on your journey through the upcoming year. I hope you will make your resolution's realities this year and meet your goals. Having a vision for what you want to make happen is the vital first step, but planning for the journey and but unless you actually start nothing will ever happen. It is not easy to change our habits but it can be done. If it's been a while and you need a kick start then sign up for our TERRIO LiveWell Challenge starting in January. It is a comprehensive program of nutrition and exercise. 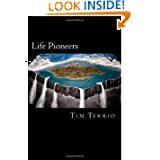 Also, read "Life Pioneers: The Edge of Possibility" and explore all the possibilities for your life. Thoughts of my wish played in my head. Come on St. Nicholas grant this for me. I’ll get up early to check, see if I got my surprise. Confused for a minute, I thought ‘what the hell’? I ran to the bathroom to check on this con. And what to my wondering eyes did appear? My gut was gone! A six pack in its place!! A completely new body but still the same face. Pec’s, Delt’s, Bi’s & Tri’s, I had muscles galore. Then it dawned on me, No, it was St. Nick! My wish he had granted! The new skinny me! I was a spectacle, something to see! It happened without diets, exercise or sweat! How simple was that, no fuss, no fret!! I wanted them all to come on the run. In their shock at the sight they just simple froze. How? What? When? They all sputtered at one time. It’s a Christmas miracle was my chime. It’s time to tell the world I’m no longer Fat!! I can’t wait to hear all the Ooo’s and the Awes. Now get me a belt so I can hold up my drawers. Cover this body up? Son you must be crazy! All the ‘magical’ programs, pills, potions and the fasts. The simplest solution, I asked Santa and I got it!! Finally free from the body that had always cursed me! My wife thought I was crazy, my face filled with dread. My old body was back just as I feared! I had to catch Santa, there he was, I caught his glance. Santa “What gives!” that’s not very nice. Come on, make me skinny, I’ll pay any price. “Your wish is not mine to give, can’t you see? But it’s not something anyone has the power to give you. “Avoid all the nonsense, the fads and the tricks. If you push too hard you’re sure to get sick. My family concerned by the expression I wore. “Is something wrong Dad, are you Ok?” Was their plea? I need to get health and I now know, it’s all up to me!! Just like Santa, I wish there was a miraculous formula or a wish that I could give all of those who need to lose weight but the truth as Santa revealed is that it's all up to us as individuals. As the old adage hold true, "if something seems to good to be true, then it probably is." The not so simple truth is that the only real method of sustainable weight loss and improved health comes from changing our daily behaviors. You need a complete plan that involves coming to grips with the baggage from the past and then planning out the new direction for your life journey. It all starts with you taking 100% responsibility for your decisions. That is the reason I wrote "Life Pioneers" to share what I've learned on my journey so far and hopefully help others explore the possibility their lives hold. I wish you all a Happy and Healthy New Years and safe travels on your life journey!! TERRIO Therapy will be starting our next "Live Well Challenge" in January. It is a comprehensive program I designed to help people lose weight and get healthy. More information or Register at www.myTERRIO.com. "Blast off in 5, 4, 3, 2, 1" and away we went launching into California Screaming at Disney's California Adventure. It's a fun little roller coaster with a couple of drops, lots of turns and one overhead loop. Since the line was short we rode it a couple of times. Over the years I have ridden a variety of roller coasters and each one is different and unique. Everyone seems to have their favorite, well that is except those who don't like them at all. While I love roller coasters nothing compares to the roller coaster of life. For some reason we like to think of life as one long smooth ride and yet we know that is not the case, life is more like a roller coaster, filled with ups and downs, neck wrenching turns and sometimes several loops. California Screaming reminds me a lot of Christmas. We wait in a long line (several long lines) and the anticipation builds. Then finally we are in place and the count down begins then suddenly its a whirlwind of action, until suddenly some pictures are taken and we arrive at the end. Some people will walk off screaming with excitement, others will be left unsatisfied that the ride wasn't what they expected and still others will be thankful that they survived and that it's over. But all be left to determine the relative ranking of how this roller coaster ride compares with others. The whole point of roller coasters is to feel that rush of adrenaline. For some the scarier the better, while others prefer a calmer, slower ride. The important part is that everyone has their relative comfort level and we all know where that edge is. It is simple to get caught up in the excitement of the ride and then the pending debate over the relative excitement level and our satisfaction. For those who decide at the last moment that the ride is beyond their comfort level there is always an exit and a place to wait and watch the others. What I think gets overlooked in the chaos of Christmas is those who were unable to even have the choice of riding or not. Those who couldn't afford the price of admission and thus reach the decision point. Those who may never know the rush of adrenaline that comes from the crazy ride. Christmas is a truly magical time for some people, but not for everyone. I am truly blessed this Christmas to have my children back home from college and we will all be together to enjoy the ride. We will gather with extended families and relive Christmas Traditions. I am sure there will be plenty of laughter, but in the quiet moments there will be sadness for those who can't be here this Christmas. Those who have passed, that we would give anything to see again and others who can't make the trip for whatever reason, but then again it's like the ride, some people will be left completely alone and forgotten this holiday. They won't know the thrill of the anticipation or the ensuing ride. What's worse is that while seemingly the rest of the world is "merry" the relative difference seems even larger. It's like being the kid standing on the outside of the amusement park watching everyone else having fun. As I said, I love roller coasters and there is nothing better than spending the holidays with family and friends. For those of us fortunate enough to have these blessings and can afford admission and enjoy the ride lets do what we can for those who don't have that ability. To those of you who are hurting this Christmas, remember life is a roller coaster, the largest drops eventually turn back up, hang in there and eventually it all comes back around. Merry Christmas! And happy holiday's to my friends of other faiths! The scale that I don’t want to see. and the damn scale that I don’t want to see. Parties and another meal with the in-laws? what we can’t say no? hangovers, now why the hell are eating? and The scale that its time I have to see. I love the Christmas season and all the sights and sounds wrapped around it. Millions of people around the world are busy preparing for the big day. Trees are being decorated, not to mention all the other decorations inside and outside of our homes and businesses. Christmas carols play on the radio and excitement continues to grow. The arrival of a notable person, thing or event is the definition of advent. There is no doubt that this is the perfect definition for Christmas. Advent is also the name of the four weeks leading up to Christmas Day in the Christian Church. The Advent season is the beginning of the liturgical year, a time to reflect on the miracle of the past and also to anticipate a second coming of Jesus, but it is not our homes and businesses that we are to prepare, it is ourselves. Sitting in church last Sunday and listening to the gospel reading about John the Baptist, I was stuck with the stark contrast of how we are to prepare spiritually vs. how we actually prepare for the same day. I still remember the magic of Christmas as a child and have relived it with my children. The unbridled joy of Christmas morning when children storm the living room to see what gifts Santa has brought them. The power of giving and witnessing the impact of the gifts in others is a great thing. By no means would I ever want to diminish this in any way and yet there is the preparation and excitement on the spiritual side as well and I think there is a lot to learn on that side. While we busy ourselves with decorating our homes as outward signs of the big day, spiritually we are to prepare ourselves by clearing the path for our relationship with Jesus. So, without getting into a theological debate about the differences of various doctrines lets focus on the common ground in Christianity. I believe we can all agree that we are to love god with all of our heart, mind and soul and to love our neighbors as ourselves. To be further inclusive all of the major religions have some form of the golden rule and the desire for inner peace. Basically that we are to enjoy a full relationship with God and with those around us. Where it gets interesting is the requirements to keep this relationship active. There isn't a long list of rules to comply with, there are simply the two mentioned above and if you need further clarification you can read the ten commandments. Very simple and easy rules that will allow for a complete relationship. So, why then does it seem so difficult? Why is there a constant call to change our ways and the need to continually prepare ourselves? I find it interesting that there seems to be a battle just to keep any focus on the spiritual aspect of the season. I believe it is the same reason that we struggle with our physical and mental wellness as well. It is our free will and with it the ability to choose. We can either accept the responsibility for our decisions or we can abdicate it to others or to being a victim of the past. We have the ability to determine the reason for Christmas or we can allow society to dictate it. We are constantly bombarded by the message of 'instant gratification' if you want it or you enjoy it then you should have it and yet the spiritual side of Christmas has nothing to do with the external sights of trees, lights, decorations and presents to the contrary it has everything to do with what's happening internally. There is no doubt that it has become a chaotic time with a seemingly endless list of things to be done in order to be ready for the big day BUT why does it have to be this way? In all the chaos of the season do we take time to prepare ourselves spiritually? Can we find some quiet time to make sure our internal house is prepared to allow for a full relationship with God. What if instead of feeding into the chaos we decided instead to simplify our lives and to place the focus on building our relationship with God and with our neighbors and not through material gifts but instead gifts of our time and attention? When we get to far into the 'doing mode' we sacrifice time in the 'being mode' where we are tuned in to all of those around us and to our own talents. I truly believe that our overall wellness is only attainable when we enjoy physical, mental and spiritual health. As we continue to prepare for the coming of Christmas, take time to consider your mental and spiritual health and also remember your physical health. I know it has become standard practice to sacrifice our physical health to Christmas Parties and the endless assortment of food and treats and I agree it is a lot of fun but realize the additional calories add up so counterbalance it with activity. Strange how some simple rules can make a big impact on our physical health. I have this sudden feeling of deja vu, like we've talked about this. It's been a long time since I wrote you a letter. I remember as a child I used to spend days making sure I had my letter and more importantly my list complete before mailing it off. Nothing was better than running out Christmas morning and finding all the presents. It always seemed like a Christmas Miracle. Since you always made my childhood dreams come true, I thought maybe you could help me with a little something. I would really like a new wardrobe, but the problem is that I want it several sizes smaller than my current one. Which brings me to the second part of my Christmas Wish, in order to fit into the new wardrobe, I need to lose 50 lbs. I've been pretty good this year so I'm hoping you will grant me this one, well two, Christmas wishes. Thank you and I can't wait to wake up Christmas morning to the new skinny me. PS: No offense, I think you look great, but I just want to lose some weight. Why not? How crazy is it to ask Santa to grant this wish? Christmas is coming up and since a majority of the population is now overweight or obese and Chronic Diseases are on the rise, there are a growing (no pun intended) number of people who might ask for this wish. On the surface it seems childish to ask Santa for something like this and yet we do it all the time. We look for the miracle weight loss formula and there are plenty of vendors willing to supply the next great thing. We are constantly bombarded with stories of people losing incredible amounts of weight with the latest, greatest, easiest thing ever. No work involved! Don't change your diet! No need to exercise! Don't suffer through eating salad! Just take our new Santa's Miracle Weight Loss formula and you will be skinny by Christmas morning! Now, we can just sit back have some cookies and wait for the present to arrive. How good does it feel to know that soon Santa will be on his way and will magically make us lose weight and then our health will improve and then we will be happy and then... (Sound of screeching brakes). Reality check! We all know that >95% of diets fail, but surely if you were given this gift and miraculously lost 50 lbs. you would never actually regain the weight, right? Let's look at an example from another fantasy shared by many people around the world, winning the lottery. Imagine it you wake up one day with the winning lottery numbers in your hand! Your dreams have all come true, you are instantly a millionaire with more money than you could ever have imagined!! Suddenly the world is yours and you can finally buy the things you've always wanted and be happy and..(sound of screeching brakes and a collision) "According to a 2010 study by researchers at Vanderbilt University, the University of Kentucky and the University of Pittsburgh, the more money you win in the lottery, the more likely you are to end up bankrupt." (Yahoo Finance, Riches to rags: Why most lottery winners end up broke. Golden Girl Finance). The not so funny part is that the more money people win the more likely they are to end up bankrupt. Now let's contrast this story with the recent one of Jack MacDonald who died in September at the age of 98, he left a $187.6 million charitable trust. Mr. MacDonald amassed his fortune secretly and by various news accounts many people thought he was homeless. He had a career as an attorney but chose to live a different lifestyle. He lead a frugal lifestyle and apparently had a knack for picking stocks but think about the discipline he had to continue with his lifestyle even after he had success. So, why do lottery winners become bankrupt? For exactly the same reason that 95% of diets fail, a lack of a plan and a lack of discipline to make the necessary lifestyle changes. We can sit around and wait for Santa or some other weight loss fairy to come grant us our wish just like people buy lottery tickets against astounding odds or we can choose to take accountability and begin to make changes necessary to create the life we want. The odds of winning the lottery are 1 in 100 Million and we continue to buy tickets. The odds of developing type 2 Diabetes will soon reach 1 in 4 and yet we continue to ignore the warnings. Over 80% of type 2 Diabetes and Heart Disease are preventable but it comes down to making the choice to do something about it or waiting for Santa to deliver a gift. If you think the odds of winning the lottery are high try calculating the odds of Santa granting this wish. The holidays are a great time to gather with family and friends, and create cherished memories. It really comes down to what you value most in life? We are all on a life journey of our own creation, the question is does it match what you value most or is it time to map out a new journey?